A Northwestern fencer dodges an opponent. The Wildcats are headed to Duke this weekend. At this point in the season, Northwestern’s coaches have a tough job: to find balance. The No. 2 Wildcats (36-3) will head to Duke for the final regular season meet of the year this Sunday. NU will attempt to get wins while testing its fencers against a slate of five teams that includes two from the Top 10. The Cats are coming off a 9-2 showing at the NU Duals this past weekend, which included a tight 14-13 win over No. 8 Duke. They will face the Blue Devils again, along with No. 4 Penn State, Air Force, North Carolina and Boston College. As the last meet of the regular season, this Sunday’s bouts are one of the last chances for coach Zach Moss, a Duke alumnus, to decide on who he wants representing NU for this year’s NCAA postseason. 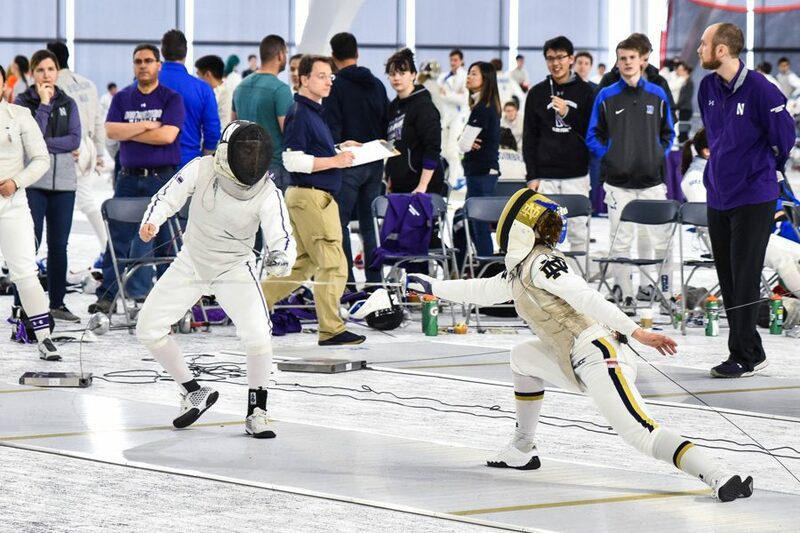 After a break for the Junior Olympics next weekend and the Midwest Conference Championships the week after, the Cats will send 12 fencers to NCAA Regionals on March 9, four from each weapon squad. At that point, the lineup will be out of the hands of the coaches, and each fencer will have a shot at progressing to Nationals. Who goes on will depend on the results at the Regionals meet, but also on individual records throughout the season. At this point, Moss said he has to find a way to help his team and his fencers prepare. “It’s a delicate balance. We’re trying to get as many individuals in the best place that they can be to try and qualify at NCAA championships, while also trying to win every match we can,” he said. The formula for who moves on to Nationals is complex, taking into account strength of schedule, Regionals placement and overall win percentage. Moss said he doesn’t give his fencers the specifics. He tells them to fence whoever is in front of them, and he’ll assign harder competition to those fencing at a high level. With NU’s depth, the final decision could be a tough one for Moss. The Cats have won almost 67 percent of their collegiate bouts this year, and all but one of the fencers have won more than they’ve lost. One of the strongest performers has been sophomore Sarah Filby, whose 32 wins are the most of anyone on the foil squad. She said that fencing Duke and Penn State again this weekend means she and her teammates can look at old video to pick up on habits, but they already know they’ll both be tenacious teams. The vibe at the Duke meet will be what the fencers are used to from often being on the road, but it will almost certainly be a drop-off in crowd participation from last weekend at Ryan Fieldhouse. Dozens of friends and family members cheered on NU at their first home collegiate meet at the new venue. Still, junior foil Amy Jia, who will travel with Filby and 13 others to Durham, North Carolina, doesn’t think the energy will diminish.